Why Topical Light Infusion (TLi): Topical Light Infusion is the only light based facial infusion technology available that safely and effectively addresses a variety of cosmetic concerns and is far superior to other infusion technologies currently available. 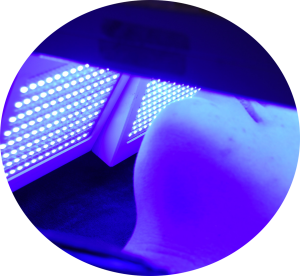 Unlike traditional LED light therapy, TLI’s active facial infusion systems are intended to combine colors of light and photo energy with topicals to directly affect the tissue being treated. TLI uses specific doses of visible light energy to propel photon energy into various layers of the skin. What to Expect: TLi treatments are safe, simple and easy. The amount of time you spend at your skin care specialist may vary based on your individual skin care needs. You can expect an individual TLi treatment to take up 30 minutes and allow for an additional 20 minutes for pre and post care. Its so simple and fast that many patients have treatments during a lunch break or on a quick stop on the way to or from work. However, the relaxing, euphoric effect usually last throughout the day. After the Treatment: Each individual responds differently; some notice changes much more quickly than others. The following principles are generalities; specific results will vary from client to client based on the client needs and lifestyle. The following protocols have been designed to address the most common requested treatments. Our treatments range between 15-30 minutes in duration. AA Rejuvenation : (2 Step Topical) New & Improved for 2018!! Skin Brightening: (2 Step Topical) New & Improved for 2018!! Thistreatment utilizes kojic acid and vitamin C to improve discoloration caused by sun damage, chemical build-up, chemical reactions from chemical peels, and excessive use of skin damaging products. This Topical Light Infusion (TLi ) process helps to normalize the melanin within the skin. The amount of treatments needed vary depending on the amount of damage to the skin the age of the client but most individuals respond well to 8-10 treatments. Scar/Post Ablative: (2 Step Topical) New & Improved for 2018!! This concentrated pre-formed mask is infused with a powerful blend of hyaluronic acid, marine collagen, peptides and nourishing vitamins and minerals. In as little as 15 minutes, these clinical strengh ingredients rapidly restore hydrations levels, improve microcirculation and calm the skin. The skin appears smoother, firmer and plumper in just one treatment. This concentrated pre-formed mask contains a potent combination of medical grade hyaluronic acid and Pentavitin, a skin strengthening and hydating ingredient. In as little as 15 minutes, these clinical strength ingredients plump up the skin and provide a deep level of hydration that can last up to 72 hours. The skin will appear luminous, hydrated and plumper after just one treatment.